Haulage and distribution specialists Spence Transport have achieved Gold Accreditation for The Fleet Operator Recognition Scheme (FORS). Radmat Building Products is very proud that their distribution partner has achieved this award. Despite being a voluntary accreditation scheme, FORS aims to improve fleet activity throughout the UK and beyond. 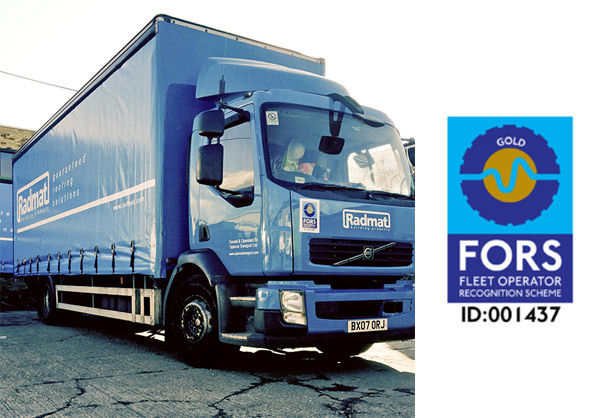 FORS accreditation is vital for deliveries into London with companies such as Mace who make it mandatory and unregistered vehicles not being FORS accredited are being turned away from sites. Established in 1968, Spence Transport has grown to become one of the leading national haulage companies. Using the latest tracking technology and logistics software, the company provides a dependable timed nationwide delivery service. With a range of innovative and exceptional building products that constantly challenge the market’s expectations for waterproofing performance, Radmat Building Products is an independent British company which has provided waterproofing solutions to some of the most well-known projects in the world. The collaboration with Spence Transport ensures the company can provide a distribution service that delivers these same exceptional standards.